In the sanctuary of Church of the Nativity, Scottsdale, where I serve, one of our most cherished items is our icon of the Annunciation. This is a true icon, written by Laura Fisher Smith, a noted iconographer (as well as the wife of +Kirk Smith, our diocesan bishop). This Annunciation is different from most traditional depictions of this event, because we don’t see the angel. We see Mary, a simple peasant girl, at the moment when the angel comes to her. 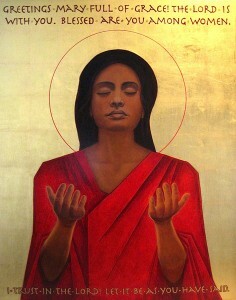 Eyes closed, hands uplifted in an attitude of prayer, we see her experiencing God’s call to her. Laura created this icon after a great deal of prayer, and after she and I had discussed our vision for this Annunciation icon. We made the conscious decision not to depict the angel Gabriel, for who can really say what an angel looks like? Surely all the gold and halos in the world cannot depict the sheer power and terror of standing in the presence of an angel. I thought of this icon last week as our diocesan clergy attended a seminar on preaching as spiritual direction. Our keynote speaker, Kay Northcutt, has written a book called Kindling Desire for God: Preaching as Spiritual Direction, in which she says that the true task of the preacher is not to explain, counsel, or entertain, but to act as spiritual director to the congregation. In this role, we should help people who are yearning for God’s presence to begin to experience it. Northcutt says that in our over-busy world, people are hungry for an experience of God. How do we provide that in worship? How do we help our congregations to learn spiritual disciplines that will open their hearts and minds to God’s voice? I interpreted Kay’s model of the preacher as spiritual director as meaning that in preaching, we help people to ask questions about real-life experience like, where is God in this? How is God calling to me right here and now? The preacher then becomes the one who teaches spiritual disciplines to open our minds and hearts, and who calls the congregation to a life of noticing God’s presence and handiwork. In our Acts 8 gatherings at General Convention, I think that many of us experienced an openness to God’s presence, through Bible study, prayer, and dreaming together about what the church could be. Now that we are home, how can we call our congregations and our church into a practice of openness to God’s presence? How can each of us act as spiritual directors to a yearning world? I had seen the icon before somewhere and loved it. Thank you for this helpful reflection pointing us toward the presence of God and spiritual direction for the communities where we serve. Thought provoking. Though I confess that I’ve never gotten much out of individual spiritual direction, I do like the image of pastor as one who “should help people who are yearning for God’s presence to begin to experience it.” I especially like your thought that doing so is at the heart of preaching. I think I have been trying to do this in my own preaching. I am convinced that good preaching is not teaching, and though many use the sermon as an opportunity to make up for low attendance in education programs, I think communities are the poorer for it. I am also convinced that it is compelling preaching that most significantly determines whether a parish draws in and keeps new members or not. So, thank you for articulating what was just a little fuzzy for me. Good comments, Jon. You articulated some issues I think about, too. The sermon IS the only formal Christian education that most of our people get. However, if you’re going to start at square one with Christian education, maybe the best place to start is with wondering where God is, rather than trying to do complicated exegesis. It certainly made me think about getting clearer about my purposes in preaching. Thanks for the comment!